This USB-C™ multiport video adapter offers a portable solution for connecting your USB Type-C laptop to aVGA, DVI or HDMI® display. Avoid the hassle of carrying different adapters for different displays with this 3-in-1 USB-C adapter. WithVGA, DVI and HDMI output, you can connect your laptop to virtually any display. The HDMI output on this USB-C video adapter supports UHD 4K resolutions, providing four times the picturequality of high-definition 1080p. 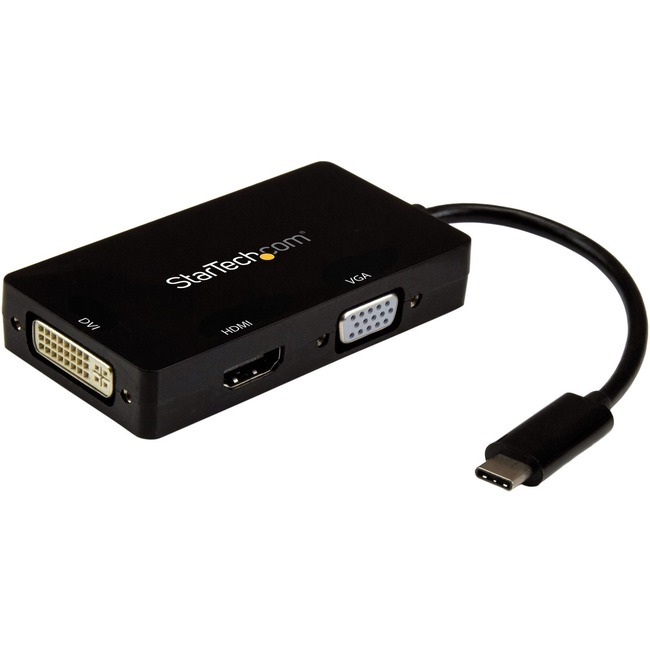 All of the outputs (HDMI, VGA, DVI) can support high-definitionresolutions of up to 1920 x 1200. The convenient plug-and-play USB-C dongle is the perfect travel accessory. Fitting easily into your laptopbag, and offering three video output options, the USB-C display adapter is an ideal solution for Bring YourOwn Device (BYOD) applications, wherever you go. The CDPVGDVHDBP is backed by a StarTech.com 3-year warranty and free lifetime technical support.